Que diable est-ce qu’ils font là haut! English: What the devil are they doing up there? Appearing in Le Charivari three weeks before the collapse of France’s Second Empire (1852-1870), the subject is a satirical commentary on the Franco Prussian War, in which Emperor Louis Napoleon had foolishly involved France. 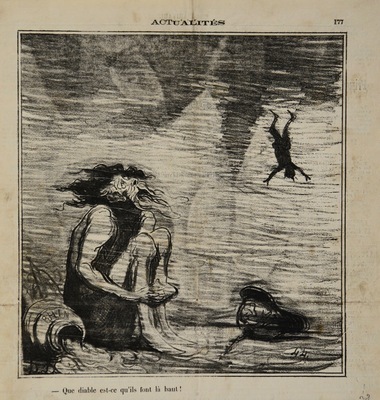 The print features Father Rhine, god of the river separating France from Germany, who fails to comprehend what is happening above the water. Next to the god is a Prussian helmet that has sunk to the river’s bottom and above him a dead soldier’s body floats on the surface.